Bitcoin’s dominance and total market cap remainsat 53.3%. and $114bn respectively andoverall volume is downby more than 18% from the previous week. 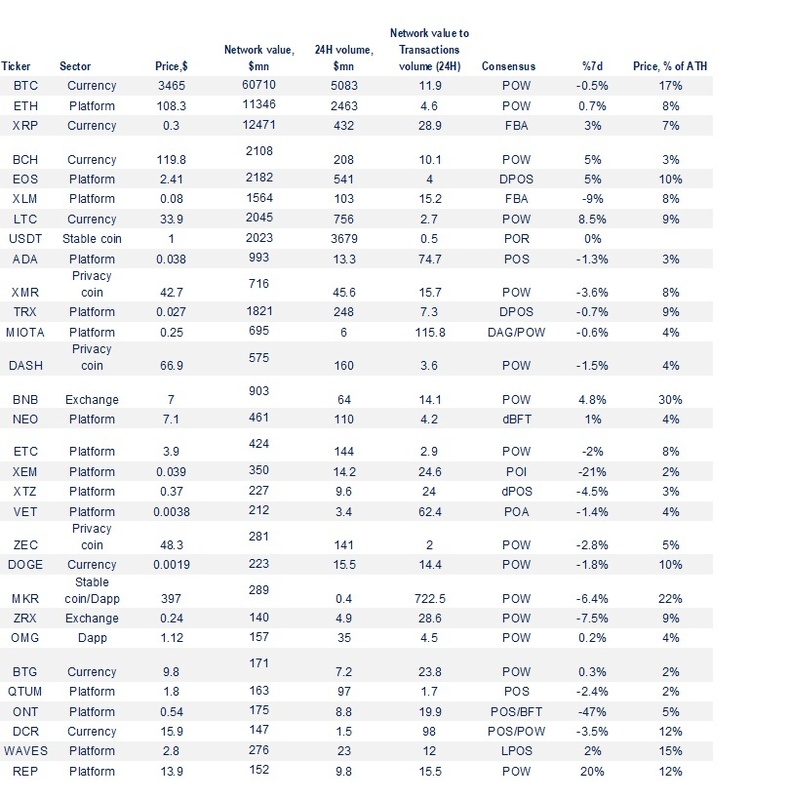 Bitcoinis downby 0.5%, Ethereumisslightly up by 0.7%, XRP is up by3%, and EOS isup by 5%. 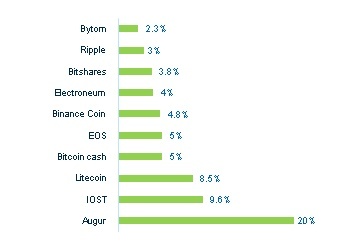 The best performers among the top-40 crypto wereAugur (20%),Litecoin(8.5%),EOS and Bitcoin Cash (5%). Positive news around the launch of Fidelity’s custody solutions in March and the resubmission of VanEck’s ETF application have not materially affected the market. 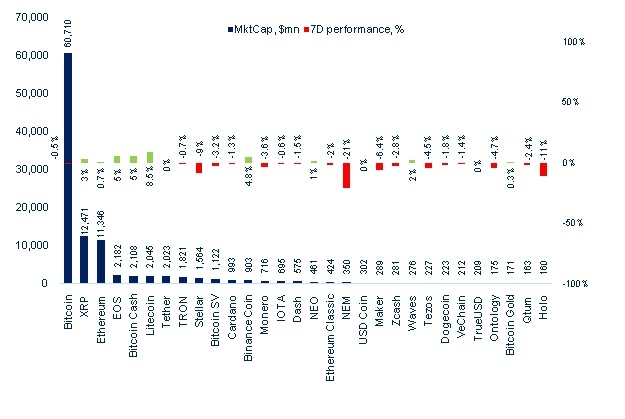 Digital assets were trading within a tight 5% range last week, with total market cap lows and highs at $111bn and $116.5bn respectively. Overall volume is down by more than 30%, from the week’s high of $22bn, currently at the $15bn mark. Bitcoin has found support at $3,400 after a small plunge atthe beginning of last week with a quick recovery back to a ~$3,460 range. Bitcoin saw some activity towards the end of the week, with an attempted breakout stopped at $3,550 but is now back at $3,450 at the time of writing. Similarly Ethereum, trading in a 5% range, has found support at $104 and resistance at $110 and is down by 1.5% compared to last Monday. 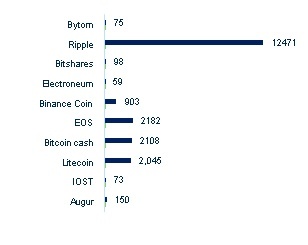 The second largest digital asset Ripple had spiked by almost 15% on Wednesday, however the bullish momentum only lasted a couple of hours and XRP is now back above the $0.3 mark, 3% higher since last Monday. 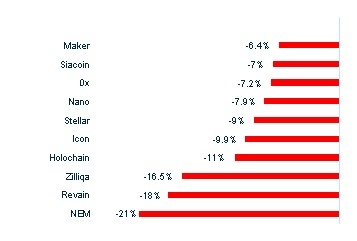 Fourth and fifth largest assets EOS and Bitcoin Cash are both up by 5%. 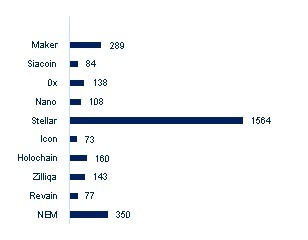 Source: coinmarketcap.com, as of 4thof February2019 as of 09:00 AMGMT. Ukrainian exchange Liqui is shutting down its services due to a lack of liquidity, while Canadian exchanges QuadricaCX owes its customers $190m after its founder died, and the team isunable to access most of the funds. Security token platform TokenSoftlaunched a beta-version of their Knox Wallet, which offers support for a variety of security token standards. Knox Wallet offers three layers of protection - offline storage, role-based access control and cryptographic authentication. The US-based security token trading venueis live from Thursday, matching first orders for its tZERO tokens. The first trade saw 10 tokens bought at $8, which is two dollars less than the STO price (not considering pre-sale). The platform, for now, only operates during normal market hours between 9:30 - 16:00 EST. UK financial watchdog FCA has approved the first crypto derivative contract. London-based OTC trading firm B2C2 can now offer crypto contracts for difference (CDFs), which allow long short trading without theneed for custody.